Your pup will look scary cute in this jack-o-lantern themed Halloween Dog Harness Dress by Doggie Design. If your cute pup is so adorable, it scary, this will be your girl's go-to look during the month of October to get noticed! The Scary Cute Halloween Dog Harness Dress by Doggie Design features an all-in-one style combining the fashion of a dress with the function of a harness thanks to the reinforced D-ring at the waist. 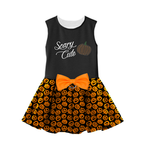 Your pup will look festive with the jack-o-lantern skirt with the "Scary Cute" embroidered applique with a pumpkin rhinestone heat transfer. An orange satin bow accents the waist. This Halloween harness dress for dogs goes on easily with touch fastener at the neck and chest for a secure and perfect fit. Your pup will look perfectly coordinated this Halloween season with the included matching leash. This is a limited-edition design. Get yours before it's gone! Halloween Dog Harness Dress by Doggie Design - Scary Cute Customer Photos - Send us your photo! Sophie is 9 months old and is ready for her 1st Halloween in her adorable dress. Posted On 11/19/18 by Dora M from Greensboro, NC Yes, Dora M recommends this product! This Beautiful Halloween Dress looks beautiful on my fur baby. Very well made and fits well. Posted On 10/24/18 by Shawnee Hills from Shawnee Hills, OH Yes, Shawnee Hills recommends this product! My Bella's Scary Cute Halloween dress arrived today ... exceptional customer service. I could not be more pleased with this precious dress and matching leash! The picture on your site doesn't do this dress justice. It is absolutely precious! And, again, I am impressed with the quality of the dress and leash. Once I groom "herself," I'll send a picture. THANK YOU for being consistently reliable!!! Posted On 10/22/18 by Cynthia from Terre Haute, IN Yes, Cynthia recommends this product! Posted On 10/07/18 by Lauren H from Allentown, PA Yes, Lauren H recommends this product! medium fits my 10.5 lbs Morkie and Roxy looks so cute. 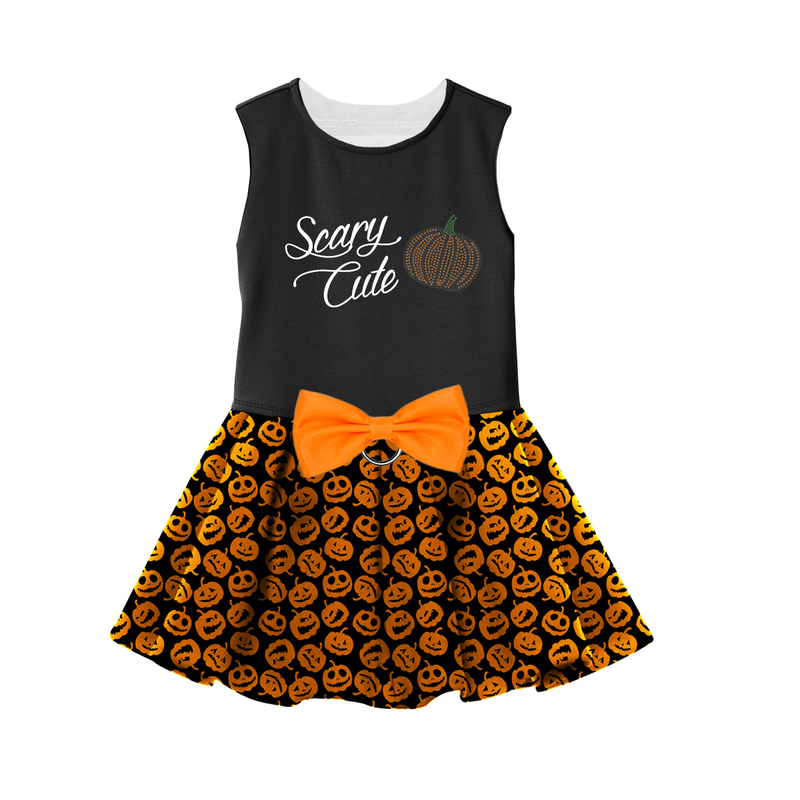 I have all 3 new 2018 Halloween dresses Girls bite back, Too cute to spook & this Scary cute dress. For some reason 2 dresses Girls bite back & Scary cute they run smaller. Thats ok it fits my dog better I wish all the medium dresses fit this way. This dress was on a great sale under $10 & free shipping. Posted On 10/01/18 by Sarah 7 from Chicago, IL Yes, Sarah 7 recommends this product! I have a small white dog, a bichon frise, who looks so adorable in this, I want her to wear it everyday leading up to Halloween.